This is the tattoo I got in tribute to my beloved daughter Moe. Our family motto is "Live without fear," and a number of us ladies were planning on getting tattoos with that motto. 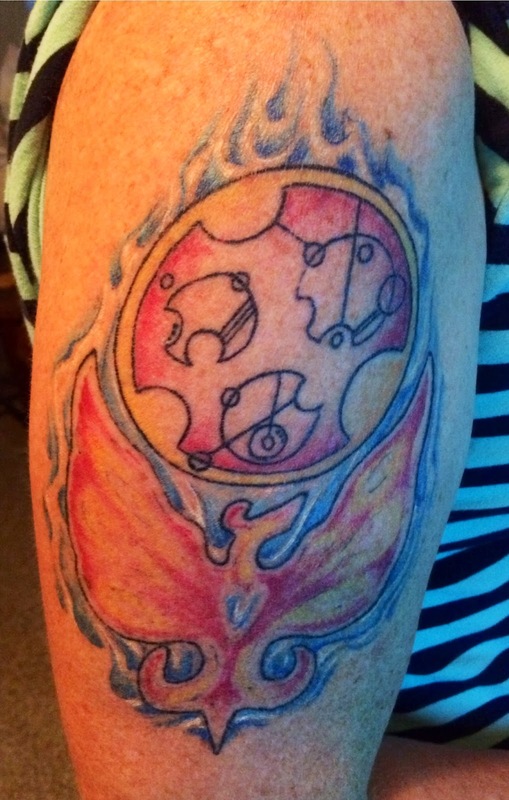 Prior to her death, she had decided on getting the motto in Circular Gallifreyan, as a fine juxtaposition of both her status as a geek-girl and a member of our family. After her death, I decided that I wanted to include her design in my own, a stylized Phoenix, and this is the design I selected. The Circular Gallifreyan was conceptualized by my daughter, the Phoenix was drawn by my Amazing Auntie Kris, the flames were designed by Dree Lovato, and the integrated design received an assist from Paige at New Life Arts. The tattoo artist is Dree Lovato of The Addiction in Aurora, Colorado. That looks great, and it's a great tribute too. Nice ink. When I'm at the hospital and someone comes in with a tattoo, I often ask if there's some importance behind it, or at least how long ago they got it. It's one way to have the patients know I'm looking at them as a person, and I hear great stories all the time.